We are currently stuck in a pattern similar to last winter. Warm air/water in the North Pacific which sends a ridge into Alaska and a trough into the eastern part of the United States. 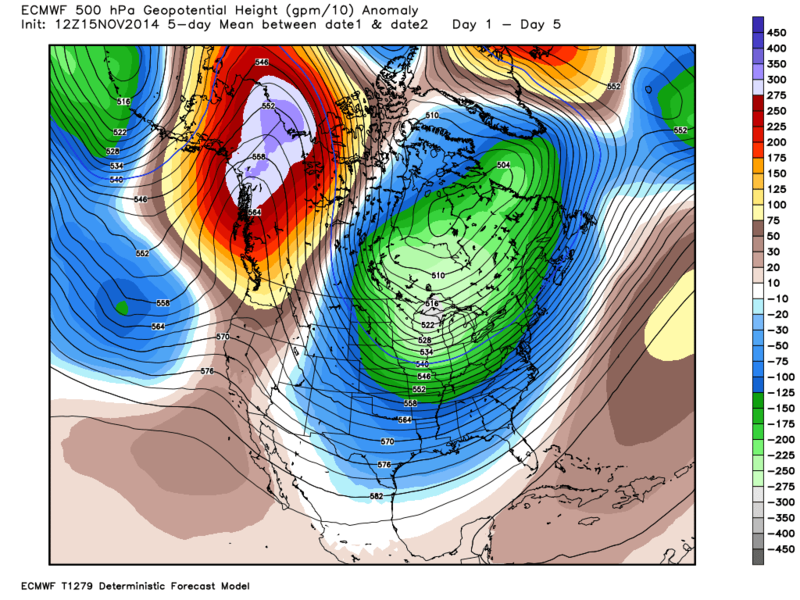 This pattern is a direct result of once Typhoon Nuri, More details. Think of it as when you send a ripple through a rope and a wave forms. The wave travels through the whole rope, the same is true in atmospheric waves. 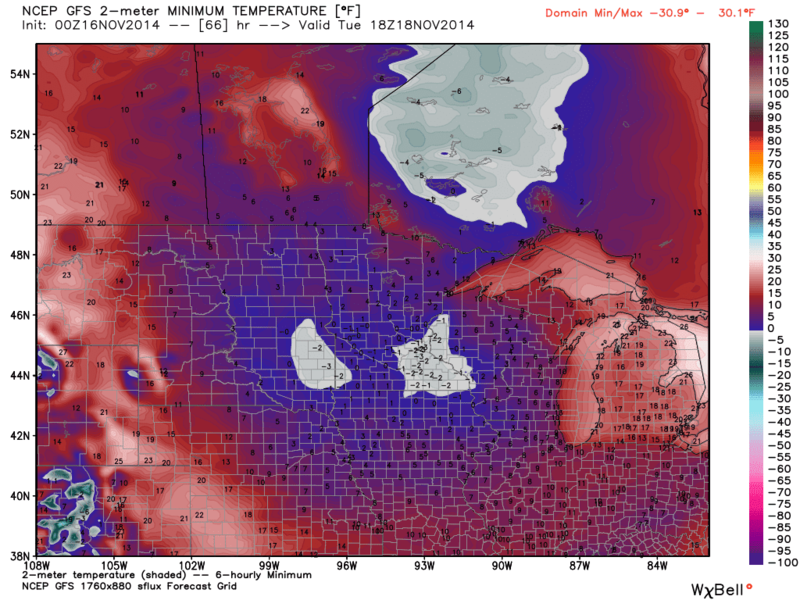 This pattern has allowed cold air in Canada to filter south for roughly a week now. It looks to continue through the next week. Above is the geopotential height anomalies, with a lower departure from average in green and higher values in red and purple. For simplicity the lower values can be though of as the location of a trough and the higher values thought of as a ridge. The image on the right shows the surface temperatures compared to normal, notice the expansive cold in just about all of the country on Tuesday. 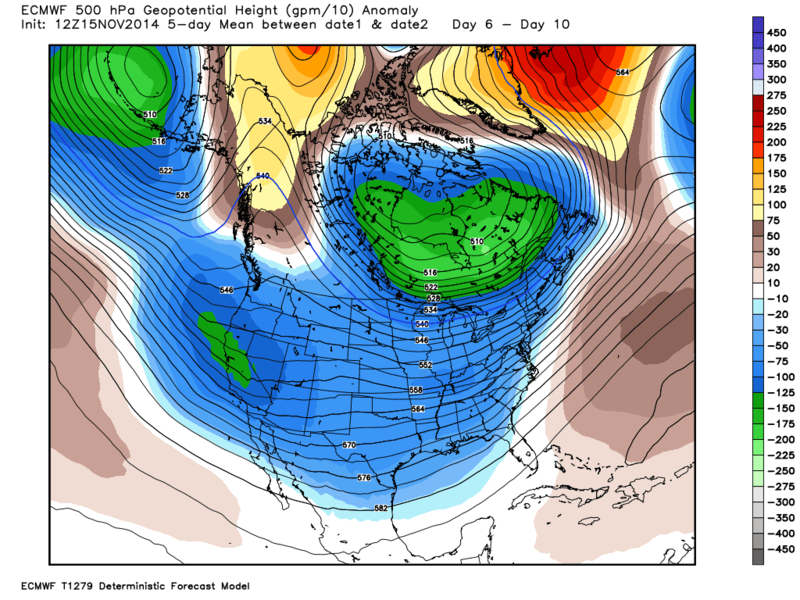 A direct result of the trough and ridge pattern, plotted above from the ECMWF model. 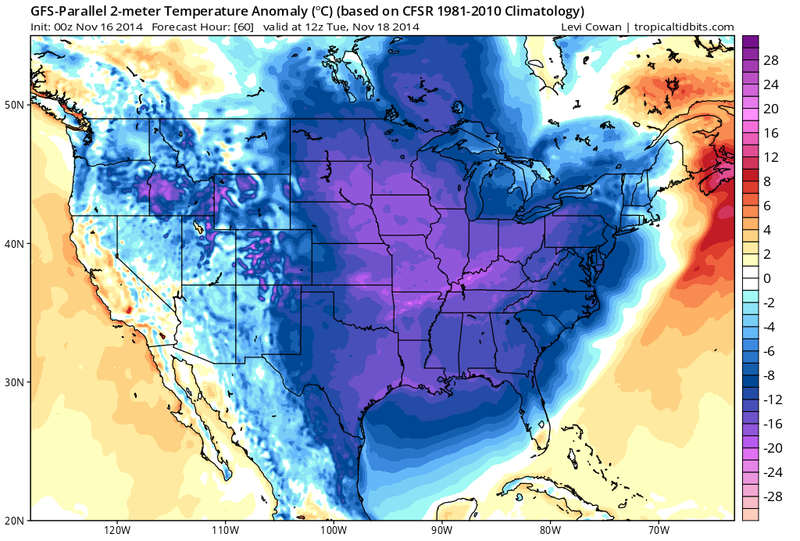 Another cold night to be expected for Monday into Tuesday as the GFS model is plotting temperatures near zero as much of the Midwest wakes up on Tuesday morning. Winds chills will will be 10-15 degrees colder than the temperatures plotted here. It will certainly feel like winter, if it has not already! A special thanks goes to a now several inch snow pack across the region, which will allow for incoming solar radiation to be reflected back into space, instead of being spent to warm the surface, as snow has a high albedo than vegetation. Some models are now hinting at the idea of a relative pattern change that would leave the United States warmer than it has been. Most of the major oscillation indices are going to a neutral pattern. This makes sense with the zonal flow plotted from the ECMWF plot on the right of geopotential anomalies. The NAO, AO, EPO, WPO all sit at neutral or close to in about a week. While this does not mean it will be warm, it does mean that we can expect more normal temperatures in about a week, after yet another arctic week of chill. 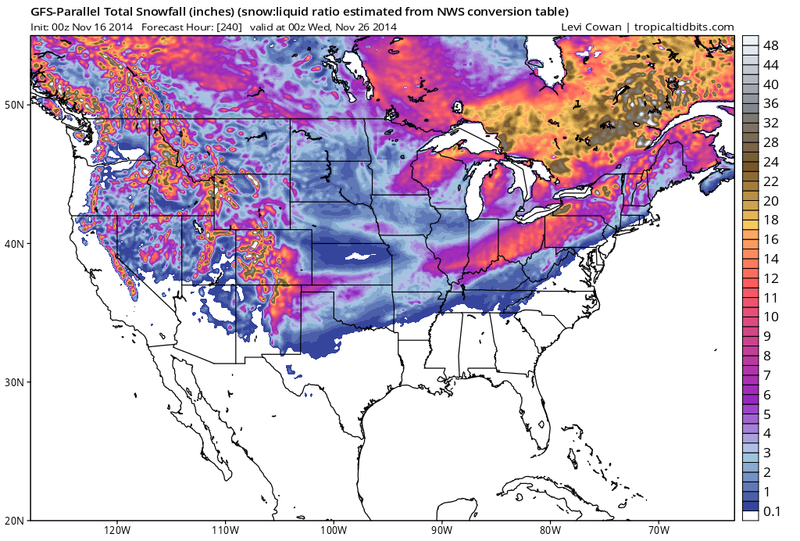 The "pattern change" could spawn a couple snow storms, or snow events across parts of the Midwest. The 10 day snow forecast off the GFS is plotted on the left. While this should not be a used as an exact forecast, it does show what is capable by the atmosphere over the next week plus. Three systems are possible, with next Friday and next Tuesday stealing the show. More details will posted in the coming days if these storm pan out. Stay tuned!